FiveFingers running shoes, which are designed to simulate the sensation of running barefoot, have received negative attention due to a class-action lawsuit against the company. Vibram USA Inc’s FiveFingers shoes have been spotted on some of the world’s most famous feet such as those of Prince Harry, Kate Hudson and Shailene Woodley. 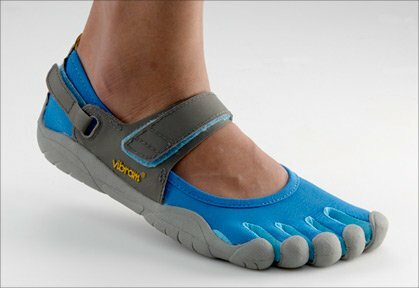 Valerie Bezdek from Florida is suing the company for making misleading statements about the FiveFingers product. She claims that the shoes pose more risk to the wearer than regular running shoes, and even bare feet. Valerie Bezdek, who purchased a pair of the FiveFingers footwear for $104.90 in April of last year, has made claims for damages and attorney’s fees and costs on the behalf of “thousands… the precise number is unknown”. The lawsuit included information from the American Podiatric Medical Association about barefoot running to help back her case. The lawsuit stated: “Research has not yet adequately shed light on the immediate and long-term effects of this practice. Made to replicate the effects of barefoot running, Vibram USA Inc stated that their product provides “all the health benefits of barefoot running”. The FiveFingers shoes maker has not shown any details of scientific research to support their glowing claims. But through Valerie Bezdek’s research, it has been claimed that they may in fact “increase injury risk”. Valerie Bezdek also made note of the product’s hefty price tags. A pair of FiveFingers range from about $80 to $125 each. The National Sporting Goods Association claimed in 2010 that the average price for jogging/running shoes was $62.33. The price has risen consistently every year since 2008 but rarely by more than five per cent. News of the case comes after another $5 million lawsuit was filed against Boston-based footwear company New Balance in January. It claimed that the footwear company had also embellished in outling their own running product’s health benefits.